It’s been a little while since we last attempted our Premier League tips due to lots of other great sporting events taking place. We’ve had a mixed bag of late in terms of predicting the results of the games each weekend but I am confident that this weekend’s fixtures will once again see us posting a healthy profit. I place my bets each week with bet365 Sport who are my preferred choice for betting on football. There’s a great value bet365 Sport New Player Bonus on offer for new customers to the site too, which is a nice added bonus when signing up. The big game last weekend came on Monday night and it was Manchester City who came out on top, narrowly edging a 1-0 win over Tottenham Hotspurs at a somewhat bruised and battered Wembley Stadium, with the game coming just a few hours after an NFL game had been played on the same pitch. That win moved City back to the top of the table after Liverpool had reclaimed top spot following their 4-1 win over Cardiff City at Anfield on Saturday. The game saw Cardiff become the first team in nine Premier League matches to score at Anfield but it was the home side that dominated with goals from Salah, Mane (2) and Shaqiri proving to be the difference between the teams. Chelsea also retained their unbeaten record and third spot in the table as they were comprehensive 4-0 winners away to Burnley. These results leave City and Liverpool first and second in the table with 26 points, two ahead of Chelsea in third with Arsenal, who drew at the weekend at Crystal Palace, in fourth spot. Most teams were involved in Carabao Cup action in the week, though some, notably Liverpool and Manchester United had the time off after being eliminated in the last round. However, with most top teams likely to rotate players for this fixture, these games in midweek should not impinge too greatly on team selections at the weekend. Outlined below is the current standings in the Premier League, a round up of all the results on Matchday Ten, as well as who the current leading goalscorers are in the Premier League after 10 rounds of games. 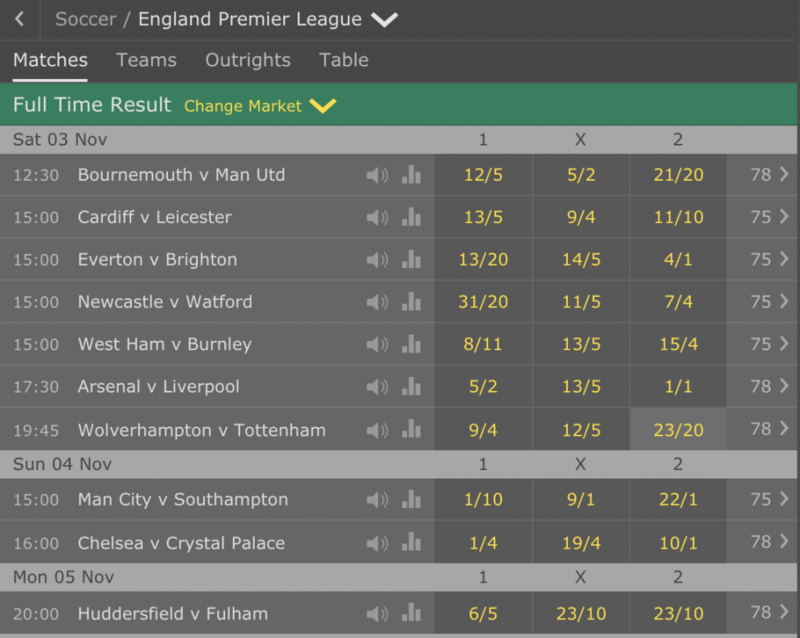 Shown below are the odds with bet365 Sport for the 11th round of fixtures in the Premier League from Saturday 3rd to Monday 5th November inclusive. Bournemouth’s game against Manchester United promises to be intriguing with the Cherries in good form and United looking to claw back the deficit they have on the teams above them, but the biggest game of the weekend should be the Arsenal v Liverpool clash at the Emirates, with the Gunners coming into the game on the back of a 2-2 draw at Crystal Palace, while Liverpool should be confident following a weeks rest after their 4-1 win over Cardiff. With Man City and Chelsea having both eminently winnable games against lower half opponents, this could be a crucial game for both Arsenal and Liverpool. Here’s my full list of predictions for all ten games from Saturday to Monday. I’m still far from convinced by Manchester United, especially in defence and midfield, but I think their attack is starting to fire and in particular Martial. Bournemouth have begun the season superbly well and they will give United a real test here, but I just think United’s added firepower in the front line will be the crucial difference between the teams. After the awful helicopter crash at their last game, this is going to be a tough game for Leicester City fans and players. Cardiff though can’t take it easy as they sit in relegation danger and need the points themselves. Tragedy however is a strong motivator at times and I can see Leicester wanting to honour their late Chairman with a strong performance and three points here and I think they’ll get it. Brighton have enjoyed a solid start to the season and Everton’s better form of late came to an end at Manchester United last week. That said, the Toffees have looked decent at home in recent games, especially late on and as such, even though Brighton did win their last away game, I am banking on a home win for the Blue half of Merseyside here. Newcastle are still without a win, while Watford have bounced back well from their little blip to record two very good wins in a row. However, Newcastle are tough to break down and while I feel they are seemingly more confident on the road than at St James’ Park at the moment, I think this is a game they need to get something from and I think they’ll do so with a 1-1 draw. Burnley come into this game on the back of a home thumping by Chelsea and it is going to be a big ask for Sean Dyche to have his men up for this game. West Ham have flattered to deceive a little so far this season but it is clear Manuel Pellegrini’s team has some real talent and I think that will likely be the difference between the teams here, so I am predicting a narrow win for the Hammers. 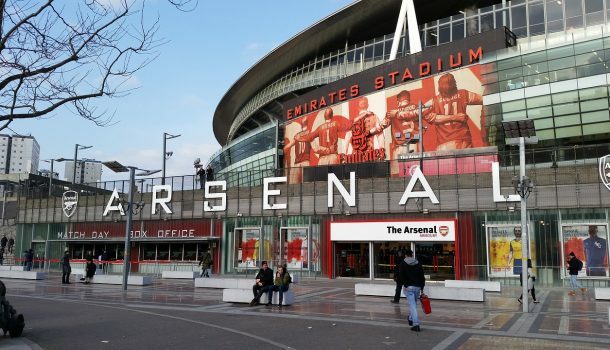 The biggest game of the weekend comes on Saturday night at the Emirates and it should be a cracker with plenty of goals if recent history is anything to go by. However, Liverpool have been much more solid defensively of late and for me, that is the key here. Arsenal have a brilliant attack but the Reds defence has been so sharp this season, whereas Arsenal’s has been somewhat poor at times. This will be a thriller but in the end, I think the visitors will just about do enough to get the win. I think this game has come at a good time for Spurs as I think a run of poor results seems to have eaten away at the confidence displayed by Wolves in the first few weeks of the season. Spurs will know that their 1-0 defeat to City was a big blow and they will want to get back to winning ways as quickly as possible and with Alli and Eriksen now close to full fitness, I think they have the team capable of earning a big win here. City did show some signs of vulnerability against Tottenham and but for some wasteful finishing from Spurs, City may well have only earned a point on Monday night. Not that it should matter against a Southampton side with just one win all season and who are looking no better this season than they were last when they struggled against the relegation. This should be another comfortable home win for the league leaders here. Crystal Palace fans will be delighted with their point earned at home to Arsenal last Sunday but this trip to Chelsea looks to be a far tougher test. Chelsea are flying at the moment under Maurizio Sarri with Eden Hazard their inspiration. It was notable that several other players grabbed goals last weekend and that is a good sign for Chelsea, who should win this game very comfortably. This is a must win game for both these teams but I think of the two, Huddersfield may be the best set to do that, simply because of Fulham’s defensive issues which have seen them ship 28 goals in 10 games so far this season. Town have improved of late and gave Liverpool a tough game last weekend and I think they’ll do enough to grab their first win of the season here. What Are the Top Betting Attractions at Bet365 Sport in November and December?